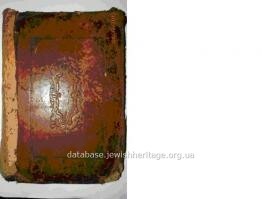 The second book of the Torah "Shemot" ("Exodus") with Rashi's and Orach Chaim comments. 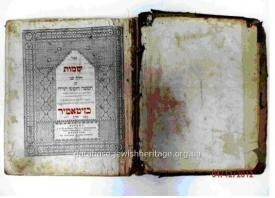 The book of the Torah "Shmot" ("Exodus") in Hebrewwith the translation into Yiddish and with comments of Rabbi Shlomo Itzhaki (Rashi) and Orach Chaim. 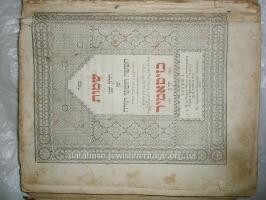 The book includes the text of 11 weekly portions and contains 401 pages. 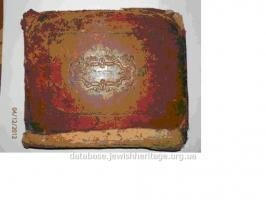 The cover of the book is made of brown leather with embossed ornament. 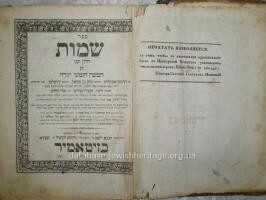 On the last page of the book there is the order of the reading of weekly portions of the Torah. The front page is art-designed, has colored inscription of the title of the book and the city of its printing. 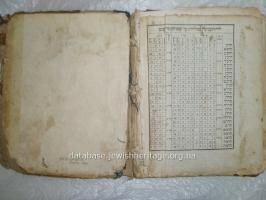 The book tells about the exodus of the Jews from Egyptian slavery and getting the commandments of the Torah at Sinai. The book is intended for daily reading. Significant rubbing, yellowing of the paper, traces of damage by beetles, the handband is torn and glued with a new cloth. The block of the book is rickety, the leather on the cover is significantly damaged, torns on the edges of pages, splotches, spots.